The most valuable asset that most people will ever own is their home. Over time, homes generally appreciate even when only essential maintenance is done. By investing just a little time and money to update and replace worn out fixtures and furnishings you can greatly increase your home's value, often recovering more than the initial home improvement investment cost when you decide to sell your home. If you can only do one project, update your kitchen. It's corny but true that the kitchen is the heart of a home, drawing people in with its warmth and aromas. If you still have those 1970's cabinets, consider replacing or re-facing them with one of the wide variety of cabinet styles available today. If your cabinets are in decent shape, consider painting them a bright white and replacing the hardware to make them look new again. Replacing your old counter tops with new granite countertops, a solid surface material or even Formica is a relatively simple project that can make a major difference. If your kitchen has room you might consider increasing your countertop space with an island. If your kitchen lacks room, perhaps you could remove a wall and open it up to an adjoining room. Now these may not be projects that just anyone would want to tackle on their own, but hiring an experience handyman would still be a very cost effective way to make improvements. A handyman's expert advice and craftsmanship can save you time and money in the long run. A close second to a kitchen remodel are bathroom updates or additions. Your house will not appeal to many buyers with only a single bathroom and people particularly value a master bath. Look critically at your bathrooms. Is there old wallpaper that needs to come down or do they need painting? A new modern vanity and sink are inexpensive, again can make a big impact and can be installed by a handyman service in just a few hours. Perhaps your tub and toilet need to be replaced because they are old or don't match. Updated ceramic tiles and hard flooring are attractive to new buyers who don't want to go through the process of updating the bathrooms themselves. Another valuable change you can make is to take down walls to enlarge small spaces and create a more modern and open floor plan, particularly if the area connects to the kitchen. Ceilings can be vaulted to give the appearance of more space and sometimes make rooms seem brighter. You may choose to add on a room or bump out a wall and the increased square footage will always add value to your home. We suggest that you inventory your house and update items that are worn out or clearly from another era such as gold or turquoise carpeting, hardware such as door handles, lighting fixtures and old heavy draperies. Painting rooms and removing clutter can also help increase your home's value should you wish to sell or just need to get it appraised. You can also replace old flooring with wood, laminate or tile and add new windows which will appeal to buyers and can increase the energy efficiency of your home. Replacing your windows is also a project that can be done a few windows at a time as the budget allows. All of these home improvements will add value to your home, not just when you sell but value in as far as quality of life as well. No one likes to fail, fall short, or miss their expectations. If you've got home renovation to do, you want to make sure you get the job done and done well the first time around. Of course, you can't get halfway through a kitchen remodeling job and quit without installing counter tops. But many projects get sidetracked, poorly constructed, or built with inferior materials because the remodel planning didn't cover all the bases. Whether you're working on the garage, a bedroom, a bathroom, the kitchen, or your living room, you want to be confident that your home remodeling will go without a hitch. For this reason, hiring a professional handyman like those at Handyman Connection to help with your remodel planning ensures that you can successfully complete your home renovation and at the quality level you desire. To start out, you need to know what your renovations will look like in the end. Draw some pictures like the room layout, new furniture or appliances, or describe them with as much detail as you can. There are several simple free room-generating programs online for you to map out your project with. If you're struggling to draw out the exact concept you've got in your mind, calling a handyman or room design professional may be able to help you with your potential layout. Don't worry about this drawing being your "final draft," it's just to get your ideas laid out on something. It's also fine to change your mind along the way about some details, but it's still helpful to have a drawn-out plan before you start. Now that you know what your remodeling will look like, start researching. Look up plans, instructions, tips and advice for your remodeling project. Lots of people have probably done the same updates already; take their advice so that you don't waste time re-inventing the wheel. It's a great idea to consult with people who have experience. Hiring a handyman to consult with you in this stage will help you explore options and materials that might not be obvious to a non-professional. While that will cost some money up front, having expert advice during these early stages will help make the entire project easier as you more forward. Proper budgeting is the key to remodeling your home. Before you begin a project you really must know how much you can afford to spend on this project. Start shopping around to find out how much your perfect carpet or counter top color is going to cost. Compare the prices on additions like on fixtures and appliances. Make sure that all of the new additions will fit inside your overall budget and trim back where needed. It would be a shame to invest a lot of money in rough building materials and have no budget left over for the cosmetic touches at the end. Divide your resources carefully. You might be doing this whole home remodeling on your own. If so, good luck! But most of us need a little help. While most of us can get friends, family, and co-workers to volunteer, in most cases you won't get professional craftsmanship from volunteers. Sometimes, hiring qualified help is essential to get the job done right. Sometimes an experienced handyman can make a key difference even if it's just for finishing touches that require an experienced hand. Your local government cares what you do in your home - at least when it comes to exterior renovation. Make sure you apply for all the necessary permits at your local town office. Here's another situation where having good handyman help will benefit you as an experienced handyman knows what permits are necessary and how to get them quickly. Dog house, dog pen and dog door installations. Trusted, reliable, professionals make us Sudbbury's first choise for home repair contractors. Spring and cleaning just seem go together. While "Spring cleaning" generally comes with an interior focus, giving some special attention to the exterior of your home after a harsh winter is just as important in terms of home maintenance. Windows: Are any of your windows cracked? Is there any air leakage around the casing or joints? Are the screens in good repair? Do any of them need to be replaced before the upcoming mosquito and fly season. Doors: How about the casing around your doors, too? Is there any air leakage? Is there a need to replace any glass or screen doors? Siding: Is there any chance that there is moisture building up behind your siding which could cause rotting or damage to your home? Take a peek yourself or hire an experienced handyman who knows how to check for you. Power Washing: Is there any dirt build up on your home's exterior? How about debris built up in the crevices of your porches or walk ways? Do you have brick or cement paths which have been covered with mold during the wet seasons? Power washing is a speedy way to clean up those outdoor surfaces. Painting: Do you have any painted exterior wood trim, decking or siding that is beginning to peel? These items may need to be stripped and resealed or painted. Temperatures are especially favorable for painting in the Spring. Water: Do you have any water seeping into your basement? Usually it's due to an exterior issue which may or may not be simple to resolve and it should be looked into immediately. Electrical Outlets: Are your outdoor power sources free and clear of debris? Do you have enough outlets? Just something to think about now so that when you need power for your next barbeque everything is working and ready to go. Storage: Are you using your garage, attic space and storage sheds efficiently? Can shelving be added to those areas to optimize your storage space? With the upcoming Spring cleaning the more accessible and organized your storage is the better off you will be. Gutters: Leaves from the Fall could be clogging up your rain gutters. If you can, get up on a ladder and clear them out. 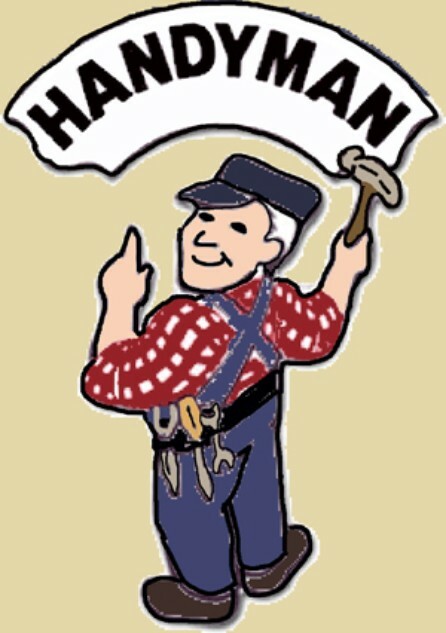 If you can't hire a handyman to clean those gutters out because if a gutter gets clogged and fills with water it could come tumbling off your roof. Do you want to use the above list as a Spring check list of things to get taken care of but you lack the time or ability? Are you looking into other parts of your exterior that could use some special attention after a harsh winter but you lack the tools or skill necessary to bring things up to par? It's okay, hiring a handyman who has the time, ability, tools and necessary skill set to complete these projects makes perfect sense.